New Printed Contract. Now the contract terms and conditions appear on second page, however, the terms may span multiple pages! In previous version, you had to squeeze the text to make it fit on the first page. 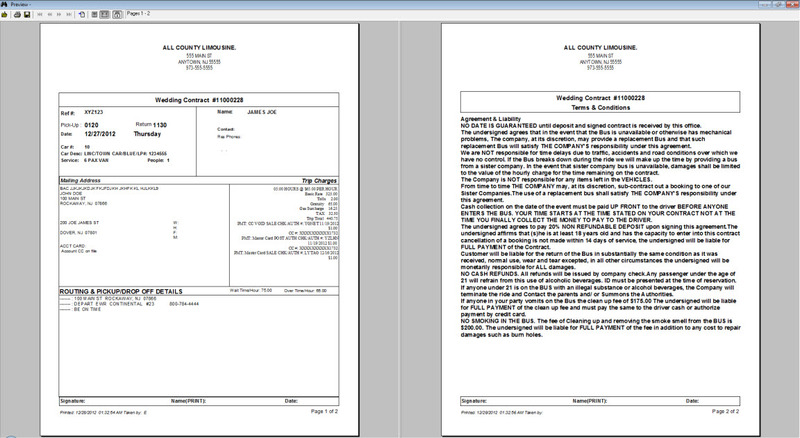 Also, the contract formatting has been updated to make it look more professional. Auto Close (shut down) LimoWiz after 20 minutes of inactivity. If limit is reached, a final warning window is displayed for 2 minutes which gives you the option of extending session or closing LimoWiz. The status bar will display time remaining; any mouse movement will rest the timer. By default this option is Off. To turn on, see Settings, Application tab. Auto Backup feature is combined with Auto Close. If application is closed and a valid backup destination (drive) is already active and reachable, a backup of LimoWiz data is performed. By default this option is Off. To turn on, see Settings, Application tab. 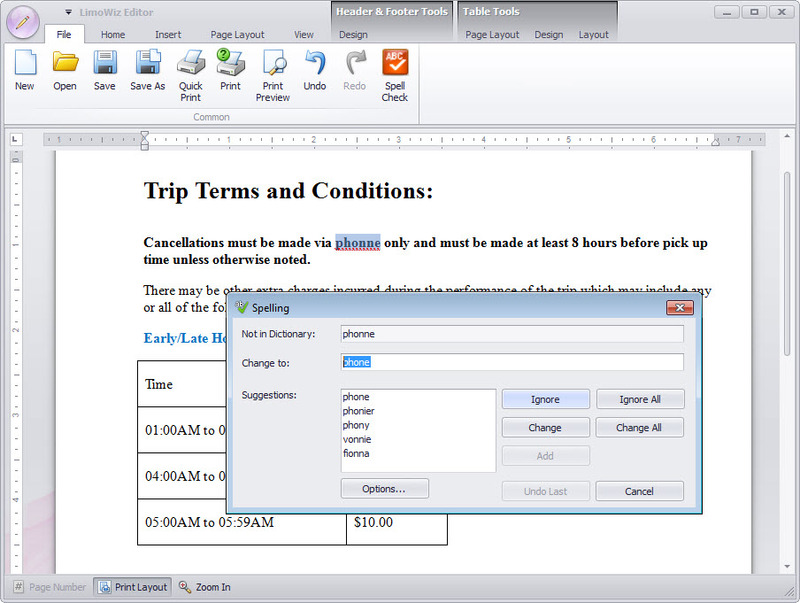 Added option to change printed contract title to replace the word "Contract" with another word. By default this option is Off. To change, see Settings, Trip Settings (2nd tab). Increased LimoWiz dynamic memory to 64 MB. It was previously set to 32 MB. This will increase LimoWiz performance. Per licensed company email account settings. If you have multiple Limo IDs license, you can create an email account for each Limo ID and LimoWiz will automatically use it when sending email. To setup, see File menu, Limo ID Email Settings. This feature is only available when using the LimoWiz email engine. Updated dispatch window refresh rate mechanism. Completed SagePay integration for the United Kingdom users. Added to check for possible duplicate reservations check when adding trip by date only. Default is trip date and trip time. See settings. Updated backup utility (critical update fix for OLE error!). Fix for county tax not clearing when round trip is not taxable. 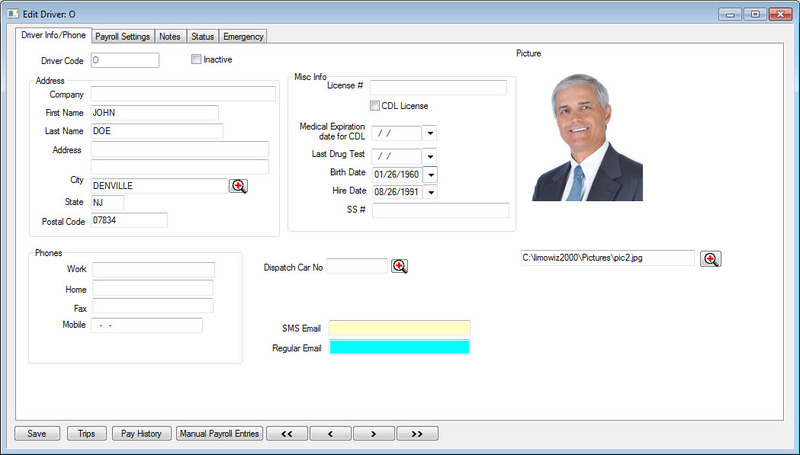 NEW: Driver Jobs Report (Less Cash Jobs) accessible in drivers payroll report style drop down list. Updated HTML confirmations and email account handling. Now emails sent using the LimoWiz are stored in a sub folder. This resulted in a smaller email database. Updated backup utility with an option to save email and PDF sub folders (recommended to select this option). Improved handling of "Off-line credit card processing". Updated LimoWiz program components to latest version including various fixes. 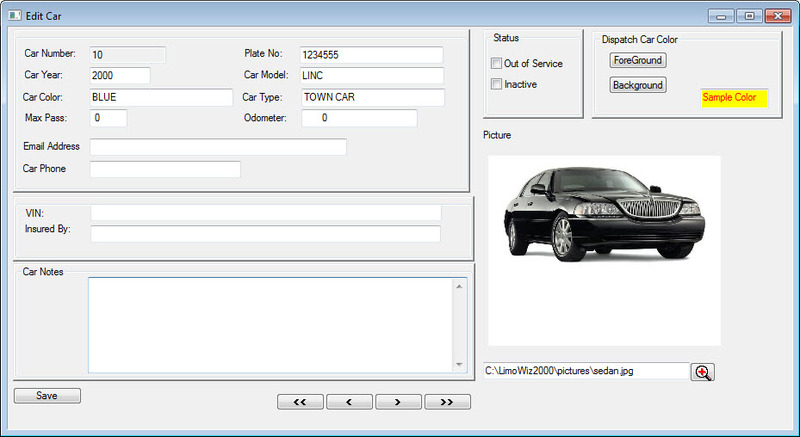 Updated new LimoWiz Editor to version 1.8. Handles spell checking. 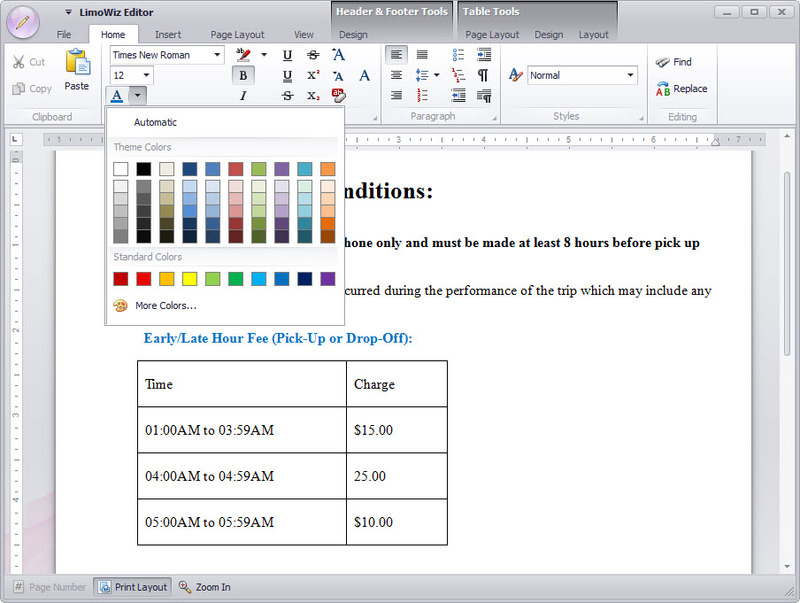 Driver Expense Report update to include manual payroll items in the driver's Total Pay column. Updated Settle to set driver rate correctly in certain situations. Tweaked the Duplicate trip button to warn about possible duplicates found and give the option to continue with duplication. CRITICAL FIX: Service Type selection did not update trip rate when the Flip button was clicked to reverse the Trip Zone. LimoWiz Editor Update: Spell checking via F7 hot key and it also checks spelling as you type. US English dictionary only. NEW: Major Update to the LimoWiz Editor program which replaces the old HTML Editor and the use of WordPad. This program is feature rich and allows you to create and edit HTML and RTF documents and it also knows the LimoWiz data folder that is set in LimoWiz. Adds Pick-Up Date to the body SMS email to drivers. Email address field length has been increased from 60 characters to 120. Phone number format can now be selected in the Settings, Application tab page. You can select a hyphen (-), dot (.) of free form. You type the phone without any formatting and LimoWiz will format the text when you tab out of the field. For example: enter 555666777, it will become 555-666-7777. Correction in Account Payment Report. Multi-Trip payment by credit card now correctly handles special characters like & in card holder's data. Reduced backup file size if using the LimoWiz email engine. Number if email sent reduced when sending to multiple recipients. New: prompt to send email confirmation when you pay a trip with a non credit card transaction. Dispatch window will remember last split screen mode status. Increase Auth/Check Number length in payments files. When sending "Thank you" email, LimoWiz was prompting to send charges even though it was applicable. Fixed.